Dress for success by adding a waistcoat, the ultimate style refresher. 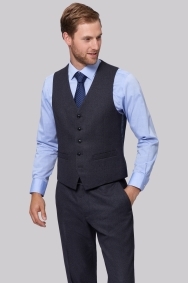 When you're suited and booted in your two-piece suit, you'll be sure to turn heads by adding this sharp waistcoat. Moss Esq. brings you a timeless classic with an on-trend twist thanks to the textured birdseye finish. Single breasted and with a charcoal silken back, it looks smart from every angle. It's exactly what you need when you want to look well-turned-out for important meetings but still feel comfortable with the regular fit giving you room to move. Team up with the trousers and jacket to earn instant style points, then choose a tie and shirt combo that reflects your personality. 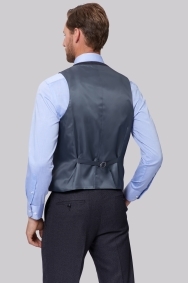 Excellent waistcoat, great materials and very stylish.